Abstract: This study is aimed to investigate how teachers’ motivational strategies use in ESP classrooms in the success of language teaching. Hence, the present study is trying to examineteachers’ motivationalstrategies and their reasons in ESP classrooms in teaching EnglishatFDIK UIN Mataram from their point of views. This research employed descriptive qualitative design on lecturers’ motivational strategies in ESP classrooms. The subjects of this study are four lecturers of ESP classes representing each departmentsat faculty of dakwah and communication science (FDIK) ofUIN Mataram. Management dakwahdepartment, Islamic community development department, Islamic counseling guidance department, and Islamic communication and broadcasting department. 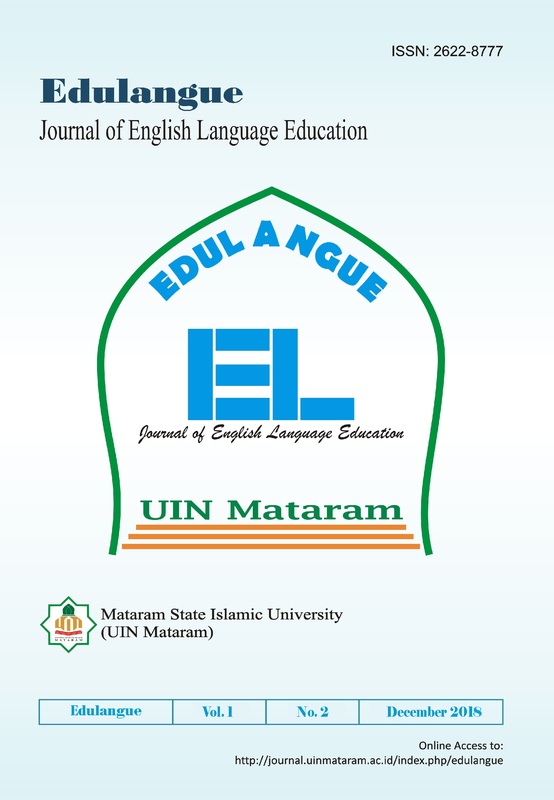 Then, it was found that ESP teachers in FDIK UIN Mataram generally employ all Ten Commandments for motivating language learner as proposed by Chengand Dornyei(2007). Further, researcher found additional motivational strategy appeared in lecturer no 3that interview strategy is not belong to the ten commandment but also stated in Chengand Dörnyei (2007)as main instrument, it is promoting self-motivating learner strategy. Finally, the reasons why the teachers consider to use those motivational strategies are: (1) bringing teaching practicality and interaction to be easier, more comfortable, and being more fun, (2) creating students’ awareness on the future success, (3) showing their care on students’ learning improvement and interest, and (4) being fair and wise in assessment. Alshehri, E. (2012). Saudi EFL lecturers’ and students’ perception of motivational strategies. The Lancaster University Postgraduate Conference in Linguistics and Language Teaching, 26-54. Bishay, Andre.(1996). Lecturer motivation and job satisfaction: a study employing the experience sampling method. Journal of Undergraduate Science, 3, 147-154. Cheng, H. F., & Dornyei, Z. (2007). The use of motivational strategies in language instruction: the case of EFL teaching in taiwan. Innovation in Language Learning and Teaching, 1 (1), 153-173. Day, J., & Krzanowski, M. (2011). Teaching English for Specific Purposes: An Introduction. New York: Cambridge University Press. Dornyei, Z., & Csizer, K. (1998). Ten commandmentsfor motivating language learners: results of an empirical study. Language Teaching Research, 2,3, 203-229. Dornyei, Z. (2007). Motivation in action: Towards a process-oriented conceptualisation of student motivation. British Journal of Educational Psychology, 70, 519-538. Dörnyei, Z. and Ryan, S. (2015). The psychology of the language learner revisited. New York: Routledge. Eggleton, P.J. (1992). Motivation: A Key to Effective Teaching. (online), (math.coe.uga.edu/TME/Issues/v03n2/Eggleton.pdf) accessed on April, 20 2016. Guilloteaux, M. J., & Dornyei, Z. (2008). Motivating language learners: A classroom-orienred investigation of the effects of motivational strategies on student motovation. Tesol Quarterly, 42 (1), 55-77. Hutchinson, T., & Waters, A.. (1987). English for Specific Purposes: A Learning Centered Approach. New York: Cambridge University Press. Latief, M. A. (2011). Research methods on language learning. An introduction. Malang: UM Press.